Verve Marketing Group is pleased to announce it has been named a Gold Award winner in the 2018 International MarCom Awards competition. The agency garnered the award for design and development of the New International Version website. The New International Version (NIV) is the most-read English-language Bible translation worldwide and the number one selling Bible translation in the U.S. The website is the hub for information about the translation and NIV products. It is also a destination site of free resources and articles that consumers—novice to scholar—use to read, understand, and apply God’s Word in their lives. 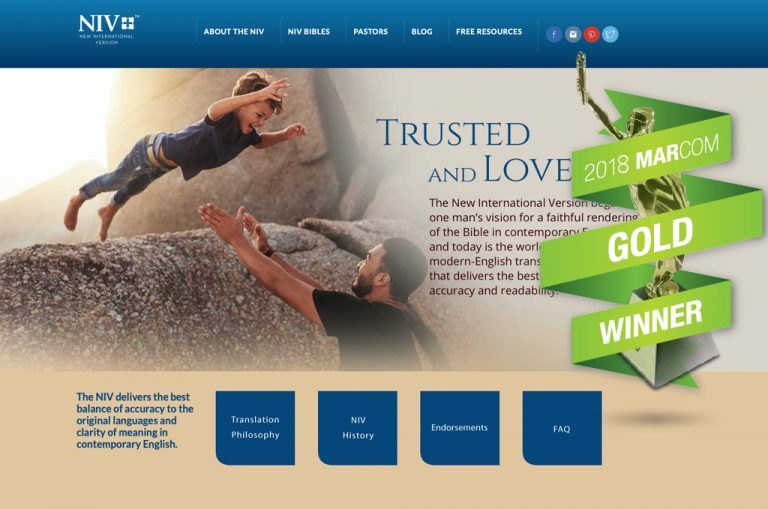 The overall look and feel of the website was created for the launch of the NIV “Trusted and Loved” campaign. The concept and tag reflects the feeling readers of the NIV have for the 50+ year old translation and its impact in their lives. The campaign is actively supported with ongoing blog and social media marketing. “Our team is grateful for the opportunity to use our time and talents to help make God’s Word known and read,” said Joan Begitschke, Chief Marketing Officer at Verve Marketing Group.